Epitinib is in phase I clinical trials by Hutchison MediPharma for the treatment of solid tumours. Epitinib succinate is an oral EGFR tyrosine kinase inhibitor in early clinical development at Hutchison China MediTech (Chi-Med) for the treatment of solid tumors and the treatment of glioblastoma patients with EGFR gene amplification. Binding of epidermal growth factor (EGF) to epidermal growth factor receptor (EGFR) activates tyrosine kinase activity and thereby triggers reactions that lead to cellular proliferation. Overexpression and/or overactivity of EGFR could result in uncontrolled cell division which may be a predisposition for cancer. Compounds that inhibit the overexpression and/or overactivity of EGFR are therefore candidates for treating cancer. 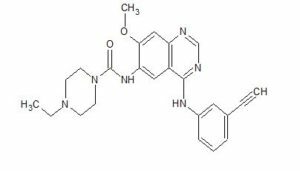 The relevant compound 4-ethyl-N- (4- ( (3-ethynylphenyl) amino) -7-methoxyquinazolin-6-yl) piperazine-1-carboxamide of the present invention has the effect of effectively inhibiting the overexpression and/or overactivity of EGFR. Thus, it is useful in treating diseases associated with overexpression and/or overactivity of EGFR, such as the treatment of cancer. Since the properties of a solid material depend on the structure as well as on the nature of the compound itself, different solid forms of a compound can and often do exhibit different physical and chemical properties as well as different biopharmaceutical properties. Differences in chemical properties can be determined, analyzed and compared through a variety of analytical techniques. Those differences may ultimately be used to differentiate among different solid forms. Furthermore, differences in physical properties, such as solubility, and biopharmaceutical properties, such as bioavailability, are also of importance when describing the solid state of a pharmaceutical compound. Similarly, in the development of a pharmaceutical compound, e.g., 4-ethyl-N- (4- ( (3-ethynylphenyl) amino) -7-methoxyquinazolin-6-yl) piperazine-1-carboxamide, the new crystalline and amorphous forms of the pharmaceutical compound are also of importance. 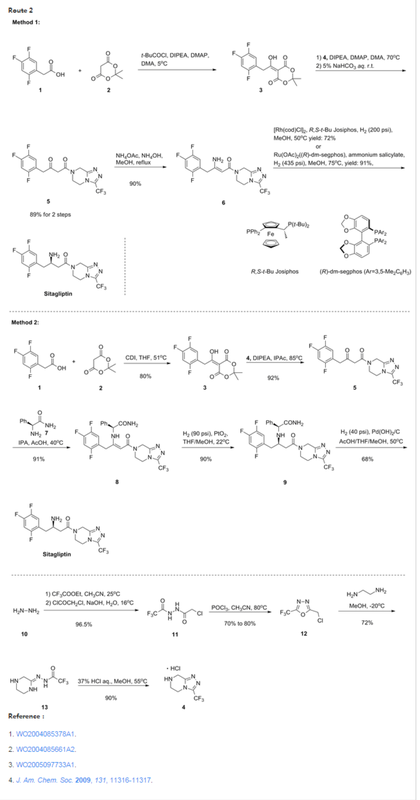 The compound 4-ethyl-N- (4- ( (3-ethynylphenyl) amino) -7-methoxyquinazolin-6-yl) piperazine-1-carboxamide as well as the preparation thereof was described in patent CN101619043A. pon extensive explorations and researchs, we have found that compound 4-ethyl-N- (4- ( (3-ethynylphenyl) amino) -7-methoxyquinazolin-6-yl) piperazine-1-carboxamide can be prepared into succinate salts, the chemical structure of its semisuccinate and monosuccinate being shown by Formula A. Studies have shown that, compared with its free base, the solubility of compound of Formula A is significantly increased, which is beneficial for improving the pharmacokinetic characteristics and in vivo bioavailability of the compound. We have also found that compound of Formula A can exist in different crystalline forms, and can form solvates with certain solvents. We have made extensive studies on the polymorphic forms of compound of Formula A and have finally prepared and determined the polymorphic forms which meet the requirement of pharmaceutical use. Based on these studies, the present invention provides the compound 4-ethyl-N- (4- ( (3-ethynylphenyl) amino) -7-methoxyquinazolin -6-yl) piperazine-1-carboxamide succinate and the various crystalline forms thereof, solvates and the crystalline forms thereof, which are designated as Form I, Form IV and Form V respectively. The compound 4-ethyl-N- (4- ( (3-ethynylphenyl) amino) -7-methoxyquinazolin-6-yl) piperazine-1-carboxamide raw material used in the examples were prepared according to CN101619043A. 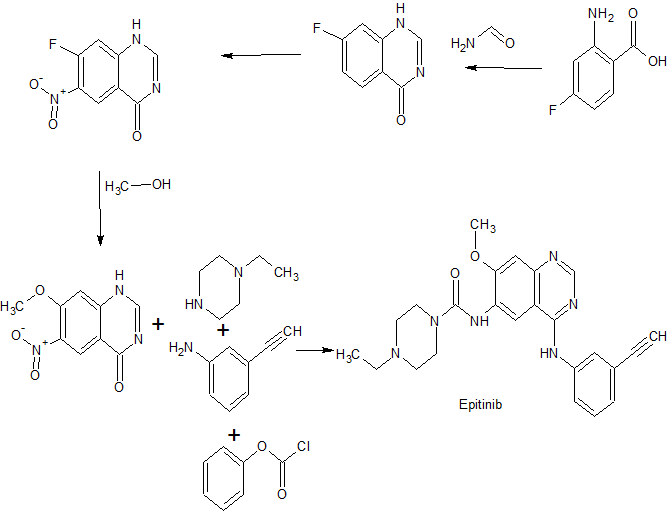 The 4-ethyl-N- (4- ( (3-ethynylphenyl) amino) -7-methoxyquinazolin-6-yl) piperazine-1-carboxamide (60g, 0.139mol) was dissolved in 150 times (volume/weight ratio) of tetrahydrofuran (9L) under refluxing. Then the obtained solution was cooled to 50℃, and succinic acid (65.8g, 0.557mol, 4 equivalents) was added in one portion. Then the obtained mixed solution was cooled naturally under stirring. The white precipitate was appeared at about 28℃. After further stirring for 18 hours, the white solid was collected by filtration, and dried at 40℃ under vacuum. A powder sample of 56.7g was obtained (yield 83%) . 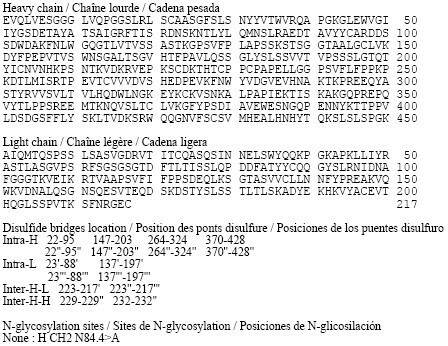 1H NMR (400 MHz, cd3od) δ 8.52 (s, 1H) , 8.45 (s, 1H) , 7.93 –7.89 (m, 1H) , 7.77 –7.73 (m, 1H) , 7.35 (t, J = 7.9 Hz, 1H) , 7.24 (dd, J = 5.2, 3.8 Hz, 1H) , 7.19 (s, 1H) , 4.05 (s, 3H) , 3.69 –3.61 (m, 4H) , 3.49 (s, 1H) , 2.71 –2.64 (m, 4H) , 2.60 (q, J = 7.2 Hz, 2H) , 2.53 (s, 2H) , 1.18 (t, J = 7.2 Hz, 3H) . The obtained powder sample is Form I of compound of Formula A, the X-ray powder diffractogram of which is shown in Figure 1. Peaks (2θ) chosen from the figure has the following values: 6.1, 7.9, 10.2, 11.6, 12.2, 13.6, 15.3, 15.9, 16.6, 17.8, 19.6, 20.4, 21.4, 21.7, 22.3, 23.5, 24.3, and 25.1 degrees, the measured 2θ values each having an error of about ± 0.2 degrees (2θ) , wherein characteristic peaks (2θ) are at 6.1, 7.9, 12.2, 15.3, 15.9, 16.6, and 20.4 degrees. DSC result is given in Figure 2, showing that the melting point range of Form I is about 193.4-197.3℃. By DR ANTHONY MELVIN CRASTO Ph.D in PHASE 1, PHASE1, Phase2 drugs on December 5, 2018 .